We appreciate that your AGA probably takes pride of place in your kitchen ! We also know that AGA Cleaning to keep it in sparkling condition can be an arduous task. A task that many thousands of people trust us at Ovenu to undertake on a regular basis. AGA cleaning, we believe, ought to be carried out by fully trained professionals. You’ve no need to ‘trust to luck’ with our AGA cleaning service in New Zealand as all our experts have been trained to ISO 9001:2000 standards. A very important factor to consider when contemplating the use of an AGA cleaning service is the products that are going to be used! Our unique Ovenu product that we use for cleaning the enamel areas of your AGA has been approved by the Vitreous Enamel Association (VEA). 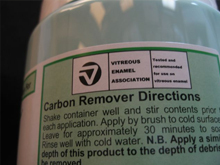 AGA themselves recommend that only products that have been VEA approved are used in the AGA cleaning process. You may prefer to call us Free on 0800 580123. Either way, we’ll be delighted to discuss your oven cleaning requirements.